A “Good Reading” or a “Good Reading” gone bad? Tips for helping to create a wonderful reading! Over the years of doing this work I have experienced a multitude of responses to readings both Angel and Mediumship that have ranged from positive to negative, thankfully with the majority in the positive category! There is an overall concept that we as humans tend to overlook when we seek out help from Spiritual advisors and that is simply that the process takes into account three parties: the client, the Spiritual Advisor, and Spirit. 1) The client – the client is coming to an advisor in search of clarity and guidance because they are feeling low or confused or whatever it is they are going through. It is important for the client to realize that they are seeking out the assistance of a person that is unbiased (the Advisor) who is bringing forward information from another unbiased course (Spirit). 2) The Advisor – The Advisor’s role is to listen openly and without bias from a loving and compassionate place to the client and without judging provide the information that Spirit is supplying to them. In essence, the Advisor is simply a telephone and just as a telephone does not filter or alter the information between two parties (as much as we would like for it to at times) the Advisor simply provides the information as it is received. 3) Spirit – Spirit is the beautiful element that looks at each of us without judgement and from a loving and compassionate stance wanting each of us to live a happy and peaceful life. Having said that Spirit will provide guidance that is meant to make the Client’s life ultimately easier and more positive (even if it does not appear so at the time). 1) Clients, please come to the session with the intention of what it is you want to cover and be open to all that is provided to you even if at first it seems as though it is not what you would like to hear or seems as though it is too difficult. You have to remember that Spirit sees things from a bird’s eye perspective and without the human ego so can efficiently provide guidance that is pure and when all is said and done for your highest good and aimed to bring you even more happiness than you originally even imagined. 2) It is always helpful to bring a notepad or recorder because there may be things that your human ego is not open to at the time or may not even process until later. This happens because you simply were not meant to “get it” quite yet and the notes or recording will allow you to re-visit and re-process things or even validate events that have taken place. 3) Please do not get upset at the Advisor if any of the information that comes through seems “wrong” or does not pan out the way it seemed as though it was going to. No matter what, there is the concept of Free Will and the information that is provided in a session by Spirit and the Advisor is only as good as your “work” in helping to make it happen as well as the free will of others if it is as matter concerning other parties. Nothing is absolutely set in stone and therefore sometimes events change or proceed down a different course than what you had thought or what had been told to you. It does not mean that the Advisor was wrong since it came straight from Spirit and Spirit is the know-all, it simply means that actions, thoughts, or behaviors on the part of the parties involved have skewed the original outcome as a result of their Free Will. Above all, the biggest take away I can share with you to make your reading a success is to be open to the information that comes through, follow the guidance Spirit provides to you no matter how challenging it may seem (nothing is given to you that you cannot handle), and know that whatever course or direction your situation takes will still ultimately lead you to the end goal or help you to develop your soul lessons as needed for future events or to even make your current situation even better than could be imagined! One of the most challenging parts of our lifetime is dealing with the death of a loved one. It does not matter how spiritually enlightened you may be or how you can possibly spin it, death is an inevitable reality that we each must face repeatedly as we walk this journey called life. Death for some is tragic and for others it is a peaceful experience. For many it signifies an ending and for others it is a beginning. There are times when death has a very profound effect on a person, and it changes one’s whole perspective on things: life, priorities, forgiveness, and much more. Other times it can have a very detrimental effect on those that are left behind as they are unable to pull themselves from the depths of despair that ensues after they lose someone that means the world to them. The most important piece of advice that the angels want to give us on this topic, is that “You are never alone in handling this grief”. It seems that during times of death, we as human beings experience tremendous feelings of loss and loneliness. However, in reality we usually pull together not only as families, friends, and loved ones, but our angels also join in to help surround us with the love that we are searching for, fill the seemingly enormous void we are now left with, and lift the burdens and heaviness that we now find ourselves carrying. There is one Archangel in particular that forms an everlasting presence in times of grief and I was guided to write about his messages in the hopes that it brings you some solace. Archangel Azrael is the angel I dub the “Grief and Bereavement Angel”. Azrael’s name when translated means “whom God helps”. His name is an important reminder that there is a Divine Presence working with us always, especially during times where we are unable to comprehend why things come to pass. Being a Spiritual Medium, I work very closely with Azrael to bridge communication between a deceased loved one and my client. More importantly, Azrael serves an extra special purpose in being that etheric grief counselor to the person who is grieving and in pain. Azrael brings a warmth that is most felt in the heart center as he gently wraps his wings around anyone who is experiencing pain and sadness as a result of the death of a loved one. Archangel Azrael says, “Death is only the beginning of a new chapter in the book of your lives. It brings with it new characters, new experiences, and new growth. If humans were to continue in this lifetime eternally, they would lack the spiritual growth that your souls seek to attain. Soul growth is the highest and most prolific experience a human can have”. Look at it similar to how you would view a movie. We as humans all have those movies that seem to drag on and on and never go anywhere. We become bored or even have walked out of the movie theater as a result. That is similar to how it would be if our lives did not cycle through. Azrael is a very powerful angel who not only assists our loved ones in the transition process but works to bring healing to those that remain and help provide them with love, strength, and emotional healing from the death that has taken place. He wants to encourage you to let go and let God and to enable yourself to cry and feel the sadness so that you can bring it all to the surface as he helps you to heal and release it. Only once it is released can a person begin to heal and it is his mission to assist you with that. Azrael says that it takes a stronger and more courageous person to let their tears flow and allow themselves to feel vulnerable than a person who holds everything within. There is no reason for people to think that they need to work through the grief process on their own. Azrael also does not want you to feel guilty or bad about asking him for assistance and possibly taking him away from someone else who is in need of his services because he is able to be with everyone simultaneously due to his omnipresent energy. Were The Mayans Right After All? For the last two years, I have been discussing the fact that the Mayans were not going to be correct and the world would not end in December, 2012. Then, Hurricane Sandy hit the East Coast of the United States and I wondered if they “did” get it right after all? I am writing this to you while portions of NJ are underwater, if not completely washed away, LaGuardia airport is a pool, and most of Long Island, where mediums live, are plunged into darkness. Did the Mayans get this right? No. Not at all, but without power, lights, heat, gasoline and living in a society that is addicted to electronics and being plugged in (guilty), it feels to many (our kids not playing video games and not being able to hold a fully charged iPad) like it is the end of the world. For those of you who really want to know the scoop on the Mayan Calendar and the potential epic disastrous predictions they did not make, there is a book that sums it all up for you, plain and simple, and it is easy to download That is when you get power back, and after you read the four thousand mindless tweets from the celebrities who are instagraming their shoes, or Halloween costumes, which we didn’t get here. In 43 years, I don’t ever remember Halloween being cancelled- all the uneaten TOOTSIE ROLLS, Miniature Hershey Milk Chocolates, Krackle, and Hershey Kisses. It used to be that you were afraid your house or car was going to be EGGED or shaving foamed on Halloween.This year, we were happy the car didn’t get washed down the block or have a tree collapse on it. 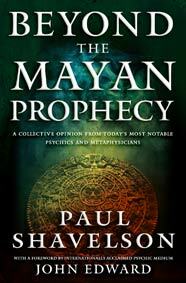 The book is called BEYOND THE MAYAN PROPHECY by Paul Shavelson. Over the course of two years, he interviewed psychics, astrologers, numerologists, mediums and more to galvanize exactly what the interpretation of the Mayan message should be for YOU… and how to shape your future with this ancient philosophy. Not to reveal anything, but I had an experience during the interview process that I will personally never forget. Throughout the process of being interviewed for this book, I was given a gift that I will be eternally grateful for when I got the chance to do one of the interviews that allowed me to literally revisit an aspect of my own life and heal through it 23 years later. If this book could do the same for you, I strongly encourage you to experience it. It was emotional for me reading it yet again. To see the force that Hurricane Sandy was, and the wake of destruction in its path, I found myself only looking at the negative impacts this energy had. Thoughts manifest realities, and it is really important to strive to be positive. That’s why the LIGHTHOUSE meditation was created… to help us bridge those moments. This force that blew in was concentrated energy with a direction and was able to move things in its path… read that last part again… out loud….A force that blew into life – a concentrated energy- with a direction that was able to move things in its path.That is what we all should strive to be; I know I want to be that for you. A force to move you… to think, to emote, to evolve! Help me be that force for as many people as possible moving forward and be a Lighthouse with me. Spread as much light as you can… one click, like, forward, tweet, etc. at a time. I was uncertain if he meant for the world? The country? Me? Regardless of how he asked the question, my guides answered by showing me a tuning fork. “All right” was his response. So… that is my goal. To try and resonate and be in tune with you and provide you with as many opportunities to participate in the conversation, event, dialogue, as possible. I will make as many available free as I can, with others that have to pay the salaries of those that make all the technical wonders happen on JohnEdward.net. Thanks as always for taking the time to respond, interact, support, and be there for each other in such the amazing ways you all truly connect. Please let me know if you do read it on my Facebook page – and tell me what you think about the end part? Making the decision to book an appointment for a private reading is a big one. It is a very personal experience that with the right energy, can and should be transformational. Once you have made the decision to do it, the reality can be upsetting that the psychic you want to work with is in a different city, state or country than where you live. Does that matter? The answer is NO! One of the toughest decisions you have to make is whether or not you should schedule the session for over the phone or make the effort to come into the office and do it in person. In my experience, there really is no difference. I know there may be psychics who have a preference, but I can assure you that it is purely a “human” one. Why have to book a flight, possible hotel and take time off from work for a session that will be an hour long? As far as energy is concerned, it is exactly the same FOR ME as the psychic. Whether you are in person or over the phone, YOU as the SITTER/CLIENT need to be present, show up and allow the process to unfold. There have been times when clients are sitting right in front of me, completely shut down. To be honest, they may as well have been in another country communicating with two cans and a string. While others, who may have “called in”, feel like they are literally sitting right in front of me. If you truly believe this, then maybe you can consider the thought that your passed loved ones, as well as information from your Guides, can come through whether you are in the same room with a psychic or 3,000 miles away calling in from your living room couch. For some of you, this is still hard to accept. When Alexander Graham Bell first invented the telephone, most people could not grasp the concept. “How is it that one can hear someone else, so clearly, when they are not even present or in the room?” Sound familiar? At first mention, people did not believe this claim to be true, but look at us today, just about everyone you know has a so called “phone” of some type in their immediate possession, making all sorts of connections. My point is simple, although the type of reading does not affect the information that comes through, you as the “Sitter” CAN actually affect the reading. So, it is important that you choose the type of reading that will most benefit YOU as an individual. As long as you are comfortable, relaxed and open during the experience, then there is no wrong way to have a reading. Based on personal feelings, you might be the kind of person that needs to be removed from your everyday environment in order to focus better on what is actually taking place during the reading, free of any possible distractions or issues that can arise during your normal everyday life. This type of setting will allow you to be more involved with the actual experience and feel more connected to your loved ones or information as it comes through. On the flip side of this, I know there have been many of you who felt more comfortable in your own home while being read, surrounded by the memories and experiences you may have shared with someone who has passed. Now, will that make the psychic’s connection stronger to your loved ones? Of course not…..BUT, if someone feels more comfortable being read at a particular location and it helps them to process what they are hearing, seeing and feeling, then it can also help give them the permission they need to be completely present during the session. It is important to remember that whether you are sitting in an office or on an actual phone call, you still have to “show up” and be a part of what is happening in the moment. Honor your own intuition and go with what feels right in your gut. Once the decision has been made, commit yourself to it. I promise, this decision is purely a “you” thing. No different than when you go to the store to buy a new pair of sneakers. There are so many to choose from, but there is always that one pair that catches your eye, but even then, they have to fit and feel right “for you” before the decision is made to wear them out of the store.